Attention to all our brides-to-be! Be sure to say "I do!" in style with a little help from Celebrations and FineStationery! 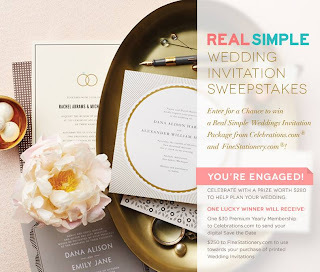 Enter for your chance to win a Real Simple Wedding Invitation Package! You're Engaged! Celebrate with a prize worth $280 to help plan your wedding. One lucky winner will receive: ONE $30 premium membership for a year to Celebrations.com to send your digital save the date and ONE $250 gift card to FineStationery.com to use towards your purchase of printed wedding invitations.